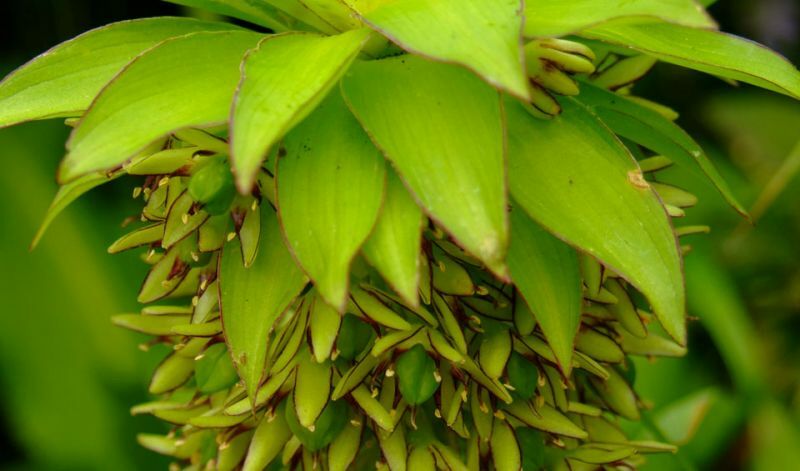 All Eucomis have an unusual somewhat exotic appearance: the flower is formed by a cylindrical spike of masses of little flowers or florets topped with a tuft of green bracts (reminiscent of pineapple plants). The large broad foliage is soft textured and wavy edged. Their look and soft pleasing colors make them good border plants for the late Summer garden. Bees love eucomis nectar. Note the small but distinct purple edges on the florets of this species.The flower stem is also heavily blotched purple. It grows taller with larger size flowers than autmnalis.